Wilmot United Church is a curious mix of the very old and the very new. For example, it is located in the heart of downtown Fredericton, in the midst of daily commerce and trade that is as up-to-date as tomorrow. Yet at the same time it carries in its own heart and soul a tradition that is distinctly symbolized in the beautiful stained glass windows that surround the sanctuary. 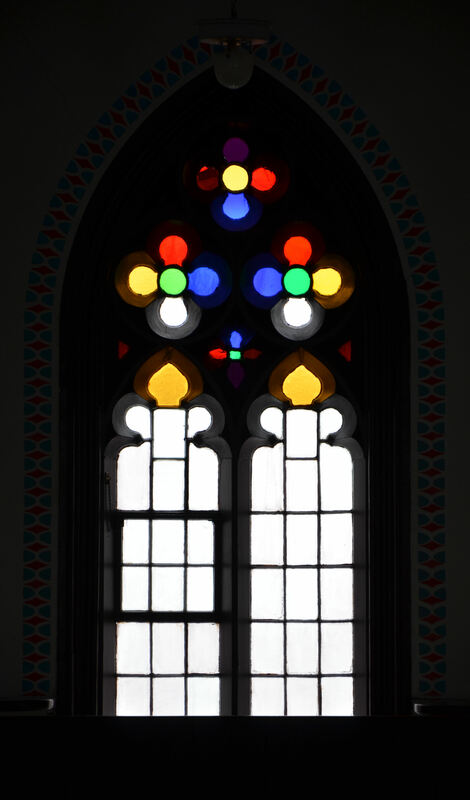 These windows are all dedicated in memory of special people of the congregation's past. If you click on each photo you will see a larger image of the window. The newest stained glass window at Wilmot United Church is located to the right of the chancel - appropriately placed, in that its dedication is "...to all choir members, choir directors, and organists who have faithfully served God and this church through the ministry of music". The window was dedicated on Sunday, November 18, 2012, the Sunday prior to St. Cecilia's Day that year. St. Cecilia is recognized throughout Christendom as the patron saint of music. She is frequently depicted playing a musical instrument, typically an organ. Wilmot's new window depicts St. Cecilia playing an organ while two more figures play other musical instruments and three additional figures sing joyfully. A horizontal bar near the bottom of the window entreats: MAKE A JOYFUL NOISE UNTO THE LORD. 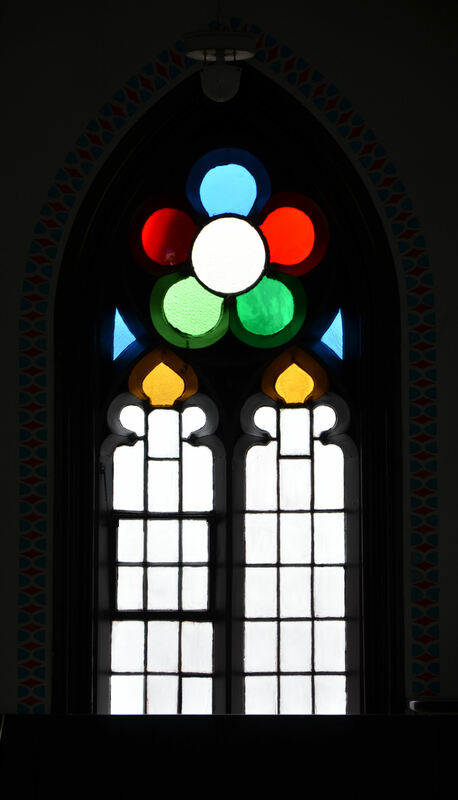 This window fills the last remaining empty space for stained glass picture windows on the main level of Wilmot Church. It was designed and built by McCausland Studio in Toronto. Presented by the congregation and dedicated on Sunday, April 21, 1974 "in grateful remembrance" of Rev. Phillips Brooks Chisholm and his wife, Ruth Chisholm, following his death from cancer in 1971 and her death in a tragic car accident in 1973. Mr. Chisholm was minister at Wilmot from 1967 to 1971. The window depicts Jesus at the seashore calling fishermen to be his disciples. This was only the second stained glass window to be installed in the church. It was installed directly opposite from the first window. 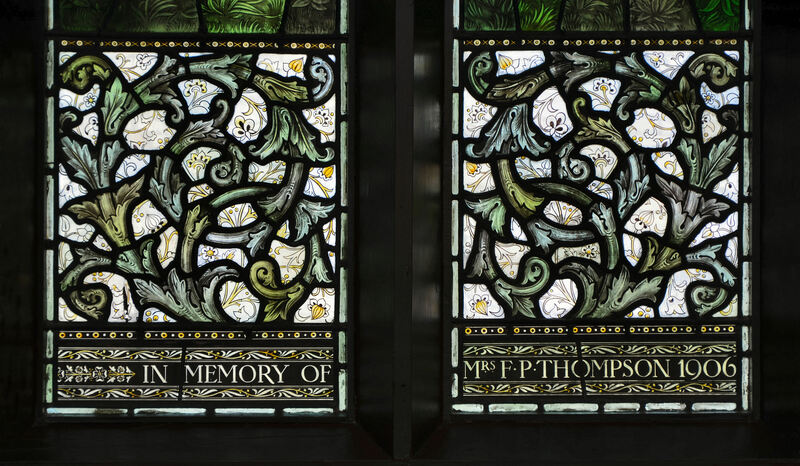 Donated by Senator Frederick P. Thompson and installed in 1913 in memory of his wife, it consists of four panels. The two top panels depict two angels: Raphael, with a cockleshell (a sign of a pilgrim); and Gabriel, with a wreathed head. The two bottom panels depict "Clothing the Naked" on the left and "Feeding the Hungry" on the right. The story of this window's fame and unique style can be found in the Tour of the Building page of our Web Site. (middle window on right side, facing chancel) This window was presented by Mr. and Mrs. Ewart C Atkinson, in memory of their parents, Mr. and Mrs. Mariner Atkinson and Mr. and Mrs. G W Coy. 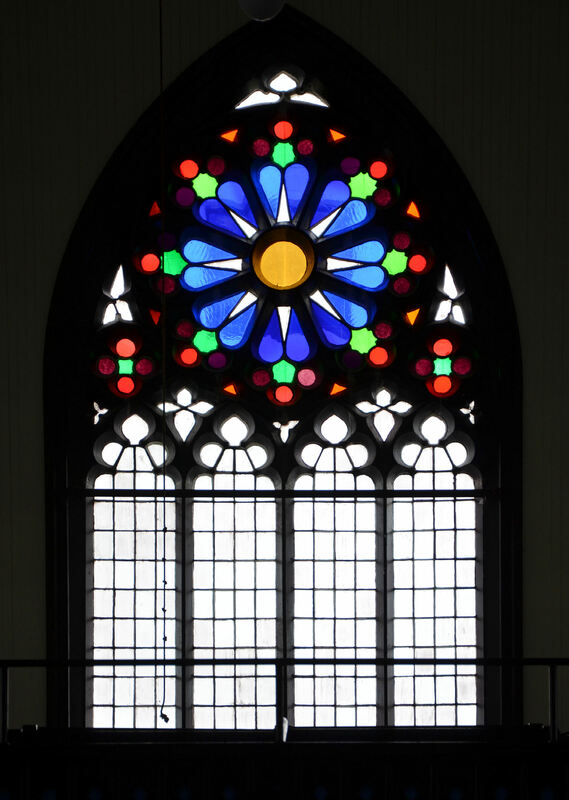 It was one of the four windows dedicated on Sunday, September 16, 1962. This window depicts the three women arriving at the tomb of Jesus as the angel declares the resurrection. 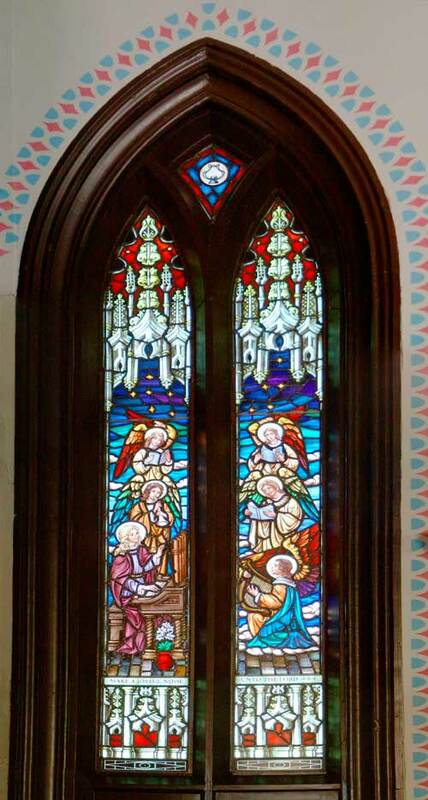 Donated by Frank J VanBuskirk, The Good Shepherd window is dedicated in memory of his parents, Mr. and Mrs. J F VanBuskirk and his two sisters, Vera and Jean. It was one of four memorial windows dedicated on Sunday, September 16, 1962. The left panel of this window depicts Jesus holding a lamb and a shepherd's crook as a ewe walks alongside. The right panel shows Jesus "Knocking at the Door" as he patiently waits for a response. On Sunday, October 5, 1980 Mrs. Basil (June) Kirk and Donald Burtt presented this window to Wilmot Church in memory of their parents, Mr. and Mrs. C A (Sandy) Burtt and their grandparents, Mr. and Mrs. Cecil H Burtt. Both Sandy Burtt and Cecil Burt had provided many years' service (a total of 50 years) in the Sunday School as well as both having served as Elders of the church. The scene depicts Jesus in the synagogue "as was his custom", and teaching from the scrolls. When this window was dedicated on Sunday, May 23, 1982 it was presented by the children of Mrs. Margaret Beairsto, in her memory and in memory of a close relative whom they considered a "second mother", Cornelia Susan (Kee) Browne. Depicting Jesus and his disciples sharing a meal with two disciples, this window is a fitting tribute to two women of Wilmot United Church who spent much time and energy working in the kitchen. This window was presented by Ashley A. Colter to honour all the people who have served God and humanity through Wilmot United Church. It was one of four memorial windows dedicated on Sunday, September 16, 1962. The window shows Jesus with three children in the right panel, while in the left side parents are depicted observing the scene of tenderness. Dedicated on Sunday, September 16, 1962, this window was donated by Mrs. Harry G. Chestnut in memory of her parents, Mr. and Mrs. R. W. L. Tibbits and her husband's parents, Mr. and Mrs. Henry Chestnut. It depicts the nativity of Jesus: the Infant Jesus, Mary and Joseph and the Star of Bethlehem in the right panel, with worshipping shepherds in the left panel. 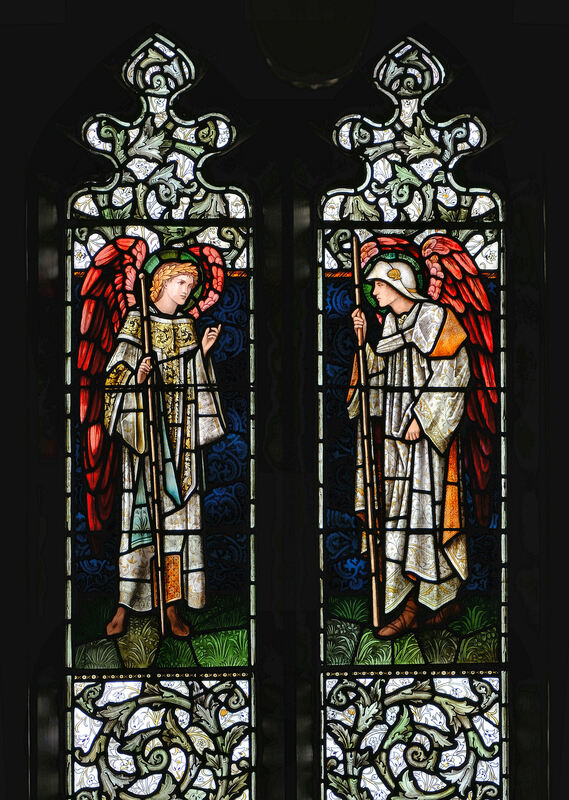 The first stained glass window (and the first memorial) in the church was installed and dedicated at Wilmot Church in the summer of 1897. Donated by Fred B Edgecombe in memory of his father, John Edgecombe and his mother, Ann J Wildman, this window was placed on the south side of the sanctuary, and is dated June 22, 1897. 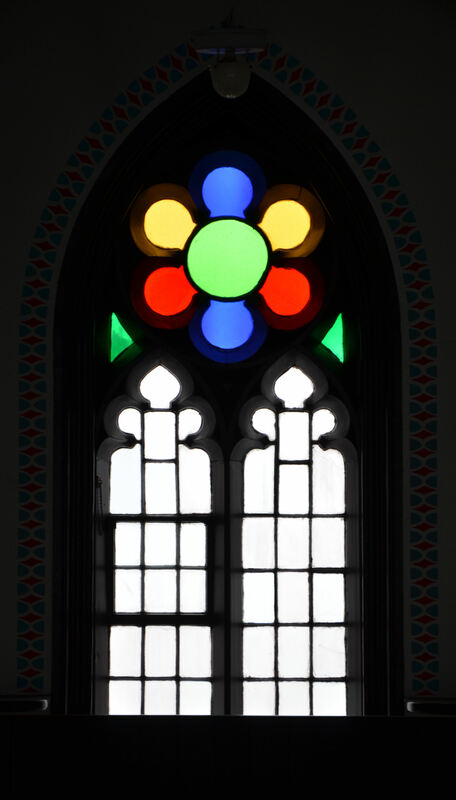 Manufactured in Canada at a cost of approximately $500., the Edgecombe window was installed in the church and dedicated as Canadians joined with the rest of the British Empire that week in celebrating the Diamond Jubilee of the reign of Queen Victoria. This window is now, of course, well over a hundred years old. 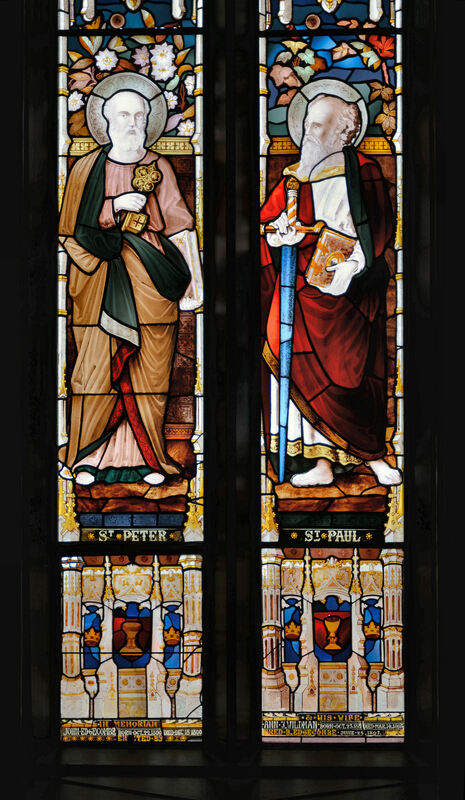 It depicts St. Peter and St. Paul. 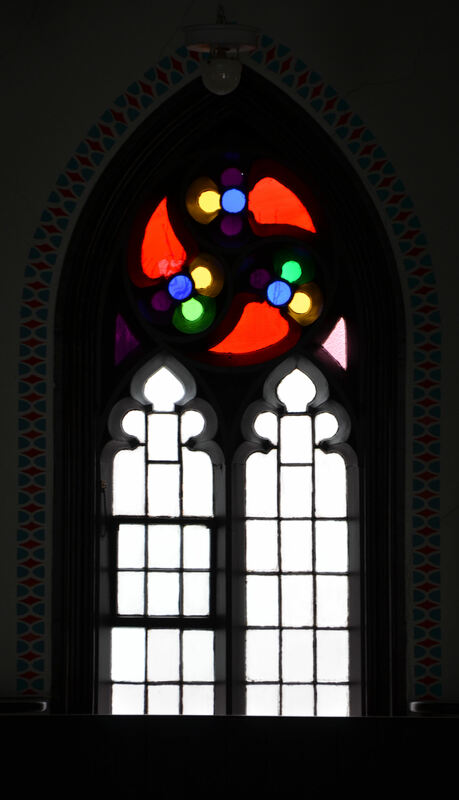 On Sunday, April 30, 1972 this window was presented to Wilmot United Church as a bequest from Mary M Blair, who had died three years earlier, in 1969. She was the great-great-granddaughter of Duncan Blair, in whose memory the window is dedicated. He was a Scottish soldier whose presence in Fredericton made its mark well over two hundred years ago, in 1791. The window depicts Mary sitting at Jesus' feet, listening to his teachings. The window at the left of the chancel was dedicated on Sunday, September 15, 1991 in memory of Richard Gordon Scott, as a gift from the family and memorial donations. He was a long time member of Wilmot, having attended while visiting Fredericton from his home in Chatham, New Brunswick when he was a boy. 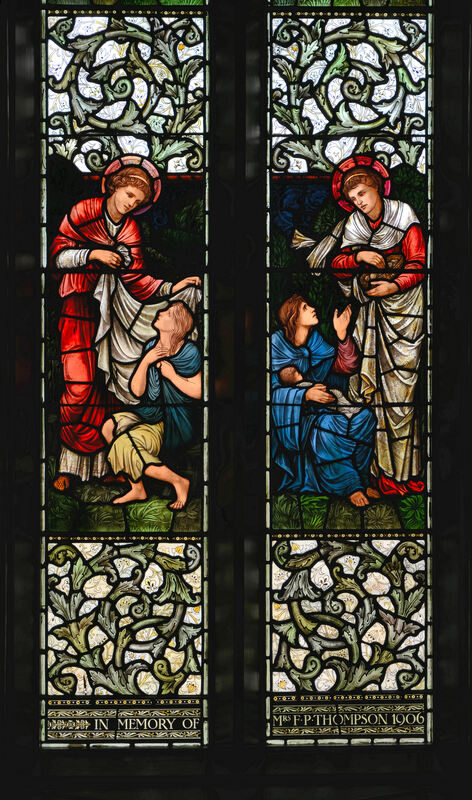 This window depicts St. Matthew and St. Mark and was created by Fredericton artist Edward (Ned) Bowes with the assistance of his partner H. Hugh MacKinnon under their company name Shades of Light Ltd. Although it was dedicated on September 15, 1991 when Rev. 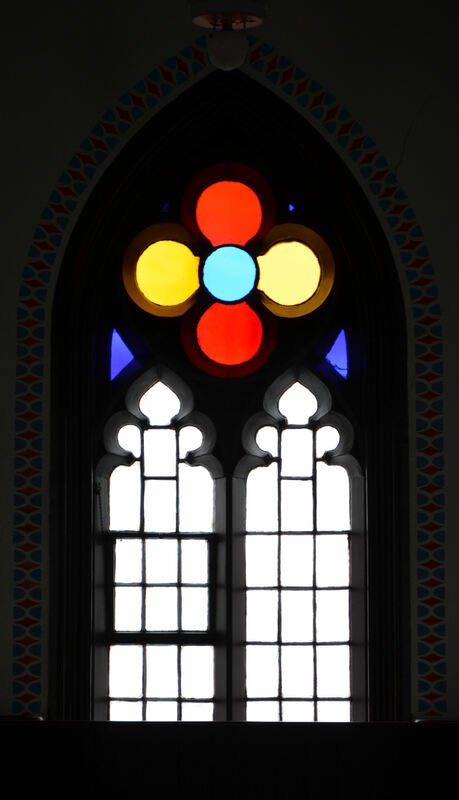 Walter Farquharson (who was the United Church Moderator at the time) was guest speaker, the window was not unveiled until a later date upon completion of its installation. 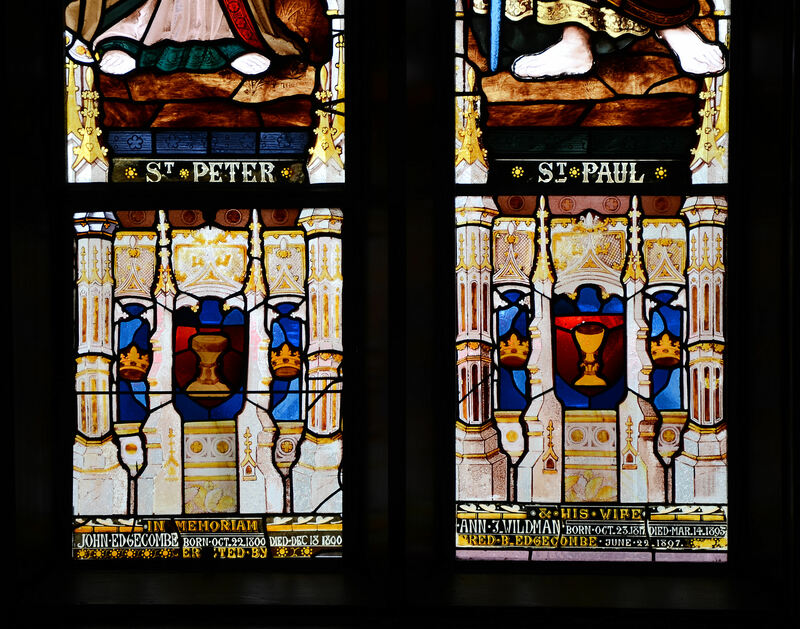 Here are some more images of our windows, taken by John Leroux.